Has anyone seen my bucket of sand? It was here earlier, I'm sure. I think I lost it after that phone call from genetics. It's got a head-shaped hole in the middle. If you find it, send it back. I had a call from the genetic counsellor today. It was expected. I'd requested it. 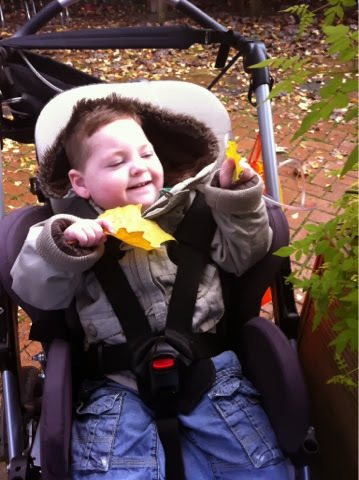 Hugh was last seen by genetics at 10 months old; so much has changed since then, I felt they needed an update in case these new developments pointed towards some hitherto unthought of genetic condition. My first meeting with the genetic counsellor had floored me. It was the misnomer you see- counsellor. I'd gone to that appointment expecting different things; counselling, support, information, understanding. Instead I was questioned about the lack of Hugh's development and interrogated about the cause of death of various family members. The purpose of the appointment was to construct an elaborate family tree and to get all the relevant information before the meeting with the Consultant Geneticist; it certainly wasn't to counsel me or to make me feel better about my failings as a parent. I left that appointment feeling like I'd been brutally stripped of any dignity I had left; I was no closer to finding out why my son was so delayed and still had no clue about what the future might hold for him. It took me a good 15 minutes of crying in the hospital toilets and a strong cup of tea in the canteen before I'd stopped shaking enough to be able to drive home. This appointment would be different though. I knew what to expect; a question and answer session where I could elaborate on the developmental progress Hugh had made and draw their attention to some of the new diagnoses he'd had since our last meeting- most notably epilepsy. "So Mrs Murphy, when we last spoke there weren't concerns about Hugh's hearing or vision... Is that still the case?" "Ah, no- he's been registered blind since then." "When we last spoke Hugh was 10 months old. He needed support to be able to sit. How has he progressed since then?" "Ah, well... He still can't sit. He can roll from his back to his front sometimes". "And he's three and a half now, I understand. At 10 months he was making no speech like sounds or babble. Does he have many words now?" "Erm.. No. He doesn't speak. Or sign. He has no meaningful intentional communication, unless you count crying and smiles." "He'd had a normal EEG and ECG when we last met,anything new there?" "He's developed epilepsy. Life threatening epilepsy. He stops breathing for minutes at a time." "Any feeding issues?" "He's fed via a tube". What I learnt in the course of that 45minute telephone conversation is that for all intents and purposes, my son has made no discernible progress in most areas of his life since he was 10 months old and in the remaining areas he has actually regressed or deteriorated. And he was already significantly delayed at 10 months old. Conversations like this used to happen regularly. Each time I'd feel depressed and miserable, then drag myself up and just keep on going. Until the next appointment. When I was asked to recount his failings again. But it's been a long time since we've met anyone new. It's been a long time since anyone's asked if he was full term, if it was a normal delivery. Everyone knows Hugh now. Hugh's just Hugh- he does things his own way, in his own time. I know he is so far off track that we can't even see the target with binoculars. I know there's no way we are ever going to hit any recognisable milestones within a socially acceptable timescale. I no longer compare him to typical three year old boys and feel sad. In fact, apart from the occasional pang when a month old baby overtakes him developmentally (usually with eye contact or an amazing ability to hold their own head up) I don't really compare him at all. You see, Hugh's health took a nose dive shortly after our last encounter with genetics. He had chest infection after chest infection. His seizures became more frequent and severe. He was in and out of hospital, week in, week out, often rushed in by ambulance. He repeatedly stopped breathing for minutes at a time, starving his tiny little brain of oxygen. Cocktails of powerful anti epileptics were pumped through his veins. He could no longer smile. Setback, after setback; seizure after seizure; illness after illness; Hugh has fought back. And miraculously made progress. And since he doesn't tick boxes on the regular developmental charts, he's decided to write his own. The first appointment with the genetic counsellor might sound horrendous, but she was just doing her job. I'd misunderstood what that job was. I was struggling emotionally to come to terms with what was unfolding around me and that appointment tipped me over the edge. During our most recent conversation, she was friendly and helpful. She didn't make me feel that Hugh wasn't achieving what he should be, I just felt deflated after the conversation as it brought the cold hard facts to light. She didn't make me feel that way. I feel your pain with these appointments, we had one like this the other week as part of statementing. I hate having to go over and over what my son can't do and seeing reports in black and white stating the fact. I love Hugh's developmental list, our kids do things when they want. That's how they roll!